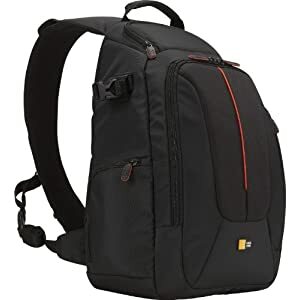 For superior camera protection we use Case Logic SLR sling bags. The design of these slings is clear that they were built with the protection of our expensive gear in mind. Inside they have a unique hammock system to suspend the camera and lens above the bottom, providing impact protection. We prefer the sling when hiking or just out and about due to the quick camera access. With the case logic slr sling, you just swing it to your front and your camera is right there. In searching for the best case logic slr sling we have narrowed the field to these two slings. This SLR sling bag is designed to keep you ready to shoot in an instant. Hang the sling cross-body, then easily and quickly swing the bag to the front for quick access to your camera. The camera compartment provides super protection for your camera and equipment. The compartment lid is lined with scratch-resistant memory foam to help prevent any lcd screen scratches. The compartment measures 7.9 x 7.3 x 7.9 and holds most SLR bodies with and attached standard lens. There is another large compartment measuring 8.5 x 4 x 5 for an extra lens, flash or other accessories. Then there are three additional compartments to hold smaller items such as extra battery, cords or memory cards. For more information on the Case Logic SLRC 205 Camera Sling click here. 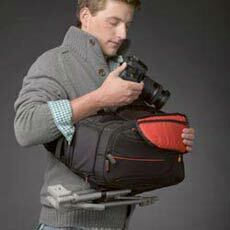 This case logic sling is designed to hold a camera with a standard zoom lens attached. 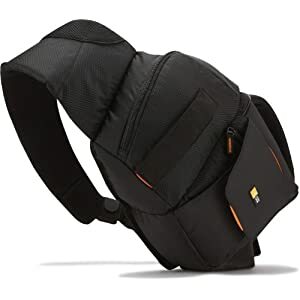 The side-entry compartment provides quick and easy access to your camera and accessories even while wearing the sling. Like the first case logic slr sling it has an adjustable divider system. An internal pocket on side flap stores extra memory cards. The weather hood fits nicely over the bag to protect from the rain or snow. For more information on the Case Logic DCB-308 Camera Sling click here.